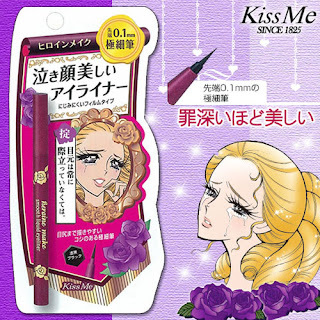 Enter an eyeliner fit for an heroine with the long name "Kiss Me Heroine Make Smooth Liquid Eyeliner". In my opinion this will fit both those who want a needle thin,almost invisible line over the lashes and those who want strong cat looks for stage with perfect,sharp edges. 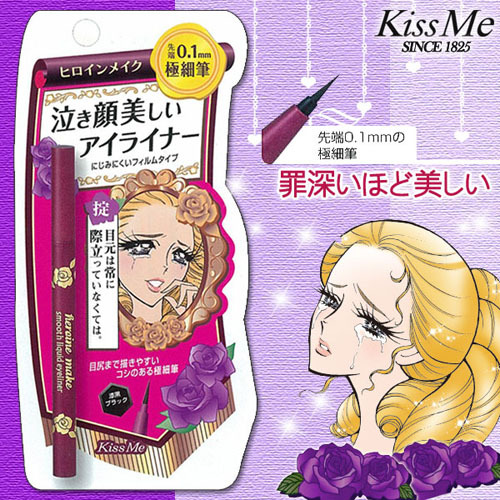 My 2 other favorite pen style liquid liners have included Koji´s Dolly Wink and K-Palette Real Lasting 24h Eyeliner (links lead to good reviews w. swatches) but my favorite is the Kiss Me Heroine. Difference in lining thickness when pressing quite firm.Upper is Revlon Colorstay Liquid Liner,lower is the Kiss Me liner.The applicator of Revlon´s liner is a felt tip pen,the Kiss Me is a tightly gathered(glued?)brush. What is wrong with the western brands eyeliners in pens then? 1.The pens are so thick that those who like a fine line have to struggle. 2.The pigmentation is often very blah,more watery than the colors it´s supposed to be. Having to go over a line you made several time to reach pigmentation irritates me. 4.The thin consistency of the formulas makes the liner run into lines and crevices,giving an uneven line,much looking like the much feared "lipstick running into wrinkles around lip"-look. 5.They just don´t stay put through heat,sweat and tears. 6.The little color you have managed to build up fades over only 6-8 hours. *Author doesn´t tear up pretty like a heroine with large crystal teardrops.Author gets swollen,running nose whenever sad,but eyeliner will stay immaculate and distract from said nose. Använder du flytande eyeliner i penna och vill ha den riktigt tunn/skarp?